At the tender age of four, HARD Events said good-bye to one of its most popular festivals, Day of the Dead. Buried six-feet under the earth and grieved by many, the Southern California event was in its infancy, yet showed many signs of promise and many hoped for a long life ahead. Tragically, the festival left us too soon, but its spirit roamed the earth yearning for the day when it can be reunited with the living. In September of this year, a miracle occurred. Through an announcement on social media, HARD Events (in partnership with Insomniac) disclosed to the living that a resurrection had materialized— HARD Day of the Dead was set to make an appearance for one night, awakening from the depths of the afterlife. The event, which last saw festival-goers rave in its hallowed grounds in 2015, was held this year back at its original home at the newly-restored Los Angeles State Historic Park. The park, which sits in the city's Chinatown district, was an ideal setting for the resurgence of the festival. With plenty of open fields, winding paths, low hills, and killer views of the downtown skyline, the park allowed guests an abundance of space to roam around, giving the festival a less-crowded feeling. The 2018 edition of the festival focused heavily on the traditions that come with the Mexican holiday it is molded after. “Dia De Los Muertos”, being a celebration of the dead, has its roots on family and remembrance, and HARD's inclusivity of the iconic rituals and decorations throughout the festival were hard to miss. In the center of the park stood a tall brightly-colored sugar skull, surrounded by a field of marigold (the traditional flower used to honor the dead). To the right, on a low hill, neon-colored crosses marked the graves of the dearly departed. The bridge above it was adorned with garland and “papel picado”, decorative banners cut from tissue paper. Inside the VIP section, a massive “ofrenda” (an altar which has a collection of objects as offerings to the deceased) was placed in the center of the area. Adorned with “flor de muerto” (flower of dead), “pan dulce” (sweet bread), and portraits of the dead, the beautifully crafted display was an attractive place for photo-ops. The holiday spirit was felt throughout the festival as HARD offered plenty of ways to get in on the fun. Free face painting was one of the more popular spots, with wait times hovering around an hour for the opportunity to transform your face into a sugar skull. Life-sized skeleton statues could be found throughout the park, as well as a colorful mural, both of which were perfect for those Instagram pics. Other unique offerings included a live mariachi, a specialty cocktail bar with aptly named drinks like “ashes to ashes” and “the afterlife”, a hot chocolate bar, locker rentals, and rare food truck offerings. This year's HARD Day of the Dead saw a more condensed line up than its predecessor, three years ago. 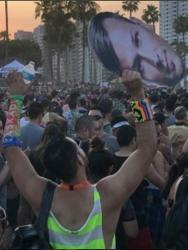 Having gone from a two-day festival to a single day event, the 2018 edition did not have attention-grabbing headliners (previous artists to grace the stage include Calvin Harris, Deadmau5, Skrillex, and Zedd to name a few), instead focusing on a more intimate event, with a big emphasis on House music. The DURO STAGE was the first stage that graced you with its presence as you entered the park. Dressed to resemble a church altar, the cozy stage packed a punch with its very impressive lineup. Playero, Dateless, Rybo b2b Lubelsky, and Omnom took to the stage the first half of the evening. As the sun set, the house beats kept coming with names like J. Philp, Rodriguez Jr., and Shiba San. To close out the night, a very special back-to-back performance by house legends Felix da House Cat and Lee Foss kept guests grooving 'til the end. The HARD STAGE welcomed some of the bigger names on the roster this year. Beginning with Jack Beats (who brought AC Slater up to the stage for a bit of Night Bass), the music was on point with the sounds of Fuego, Cashmere Cat, and Knife Party. The huge draw to this year's event also took place at this stage— A live performance by Justice and the show-stopping South African performers known simply as Die Antwoord. Considering this is the second HARD event being produced by Insomniac (the first one being HARD SUMMER—my review of that HERE), I can safely say that the collaboration of these two well known Southern California event companies has been a success. From the attention to detail and careful consideration of the traditions and decorations of “Dia de los Muertos”, to the ever-present Ground Control that makes sure everyone in attendance is safe and sound. The return of HARD Day of the Dead is a much-welcomed addition to the fall roster of California music festivals, especially those held in Los Angeles. The centralized location at L.A. State Historic Park makes it an easy-to-reach event with close proximity to not only freeways but also the L.A. metro system (its a short walk from the Metro Gold Line's Chinatown Station and a mile from Union Station). With its cohesive theme, diverse roster of artists, ideal park setting, and a loyal fan base, HARD Day of the Dead has come back from the afterlife looking better than ever. We look forward to its next reincarnation.